Google opened its first branded retail store in London today. Move over Apple and Microsoft, there’s another tech company taking its products to the retail floor with its own branded store: Google. 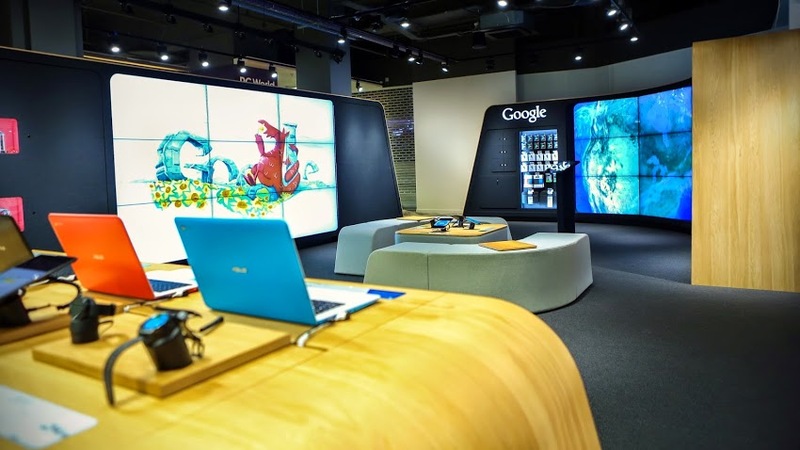 Google announced that its first branded retail store opened today in London, showcasing a range of products and interactive displays. The store, which is actually housed inside electronics retailer Currys PC World, will sell a number of Google products including Chromebook laptops, Chromecasts, Android phones and tablets and Android-based wearable devices. In addition to selling products, the store also provides several interactive elements aimed at increasing consumers knowledge of Google software tools and apps. Visitors to the store can explore the tech company’s offerings by creating doodles on the wall with digital spray paint, playing a giant game of PacMan, flying through the immersive Google Earth installation and watching Google Play movies and YouTube videos in the Chromecast Pod. Google says that it plans to host regular classes and events for the public at the store in the future. Classes will range from how to keep secure online and learning how devices work, to understanding how different devices work together to create a connected lifestyle. The company will also host “Open Houses” aimed at keeping teachers up-to-date on the latest education Google products. For the youngest teach savants, the company plans to offer “Virtual Space Camp” that will teach the basics of coding. James Elias, Google’s UK marketing director, says in a statement that the company branched out with the new store to better meet consumers’ needs. The company plans to open two additional Google branded retail shops – also to be located inside Currys PC World stores – later this year.